Both interventions and comparisons are annotated using the same vocabularies. In some reviews or multi-arm trials, the authors aim is to compare 2 or more interventions with one another without any one being designated as the comparison. Our annotation model is able to handle these - i.e. it is possible to annotate reviews or studies without specifying a comparison intervention. 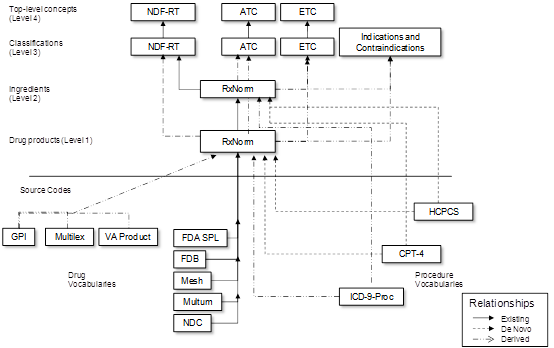 Cochrane annotations of the Condition domain are taken from the work of Observational Health Data Sciences and Informatics (OHDSI) which links terms from RxNorm to higher level terms taken from the WHO's ATC classification. The OHDSI common data model also provides links to other relevant vocabularies (such as ICD-9 and CPT-4), but we have not implemented any of these linkages at present. Because the focus of OHDSI is on drug interventions, their common data model and linkages between vocabularies are less relevant for non-drug interventions. However, we have found that a large number of the terms in SNOMED-CT are relevant and work very well. We continue to be interested in exploring the use of other vocabularies for areas that are not well covered in SNOMED CT.